L. Secale cereale, Eng. rye. 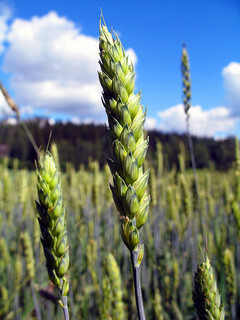 It is the first grain harvested in the summer before wheat and barley. The grain is a basic secondary supply in Castile and Andalusia. It was ground into flour and make into bread for lower classes as it was cheap. Porridges and alcoholic drinks were made with rye. Herrera calls it cold and claims that the bread is harmful for the stomach. Pliny claimed it made good turnovers (empanadas). As it is cold, it prevents them from spoiling. If eaten warm, he continued, it would glue to sores of those spitting up blood. Herrera maintains that if wild animals drank water after eating it, they would become sick and die. It is good for fattening pigs. When Rodrigo de Borgia, papal legate and future Pope, visited Alfonso Carrillo de Acuña, Archbishop of Toledo, the latter tried to entice him with the purchase of plenty of rye to feed up his sheep, calves, peacocks, capons and other rye eating birds served at corpulent meals planned to sway his guest’s will. It was a basic supply in fortresses, as seen Miguel Lucas Iranzo’s numerous battles against Morrish occupation in Jaen. Mix all the ingredients for sour dough together. Pour this into a bowl and cover with water. Leave until the mixture floats. Then it is ready to be used in bread dough. Mix the sourdough with all the ingredients for bread dough. Knead well for about 10 minutes. Put this in a large bowl and cover with a cloth. Let sit 2 hours until double in volume. Divide the dough in half. Form balls with each piece. Place them on a floured surface and squash them until a ¾” round loaves are obtained. Place each loaf on a greased and floured cookie sheet and let sit for 30 minutes until doubled in size. Make 1/3” incisions in the form of a square with a knife or sissors on the top of the dough. 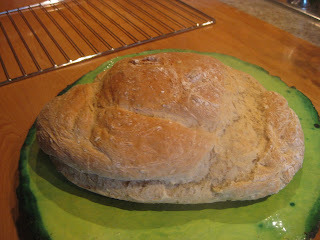 Bake loaves 20 minutes then reduce heat to 375ºF / 190ªC and bake 20 minutes more. This is a tough dry bread. To make it more crunchy, place a small heat resistant bowl fille with water in the oven and from time to time spray the bread with water. It is a sin to serve this bread cold. 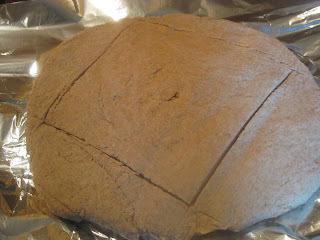 As with Jewish Passover Bread, see blog titled cenceño published October 17, 2012, rye bread is broken by hand never with a knife. Rye flour could not be found. Whole grain flour was used as a substitute. Due to the density of whole rye bread, the addition of white flour helps to lighten the loaf a little. A "peasants'" bread resulted, which is good with "sopes" dishes like pork and beans.